Every once in a while there are cases that even Sherlock Holmes would not be able to solve. Finding out just exactly where the Rusbal brand is created and sold has baffled me for weeks. 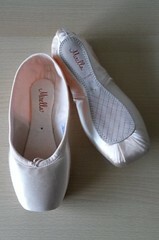 I have read varying information about the Rusbal pointe shoe on the internet. Some claim that they have been discontinued. Others claim that Rusbal is alive and well and doing business in the theater district of St. Petersburg, Russia. If Rusbal is still in business, why do they not have a website? How would any dancer be able to order a pair of pointe shoes from them? 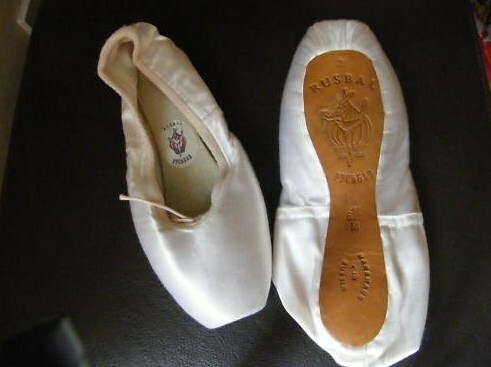 I am very curious about the Rusbal Company and these pointe shoes. It may be fitting for me to hop on a jet and travel to the heart of St. Petersburg’s theater district begging for information. On second thought, I think I might wait and see if anyone reading this might know something. 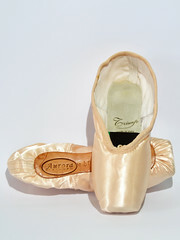 This entry was posted in Mystery Pointe Shoe Brands and tagged Pointe Shoe Brands, Pointe Shoe Images, Rusbal pointe shoes. Bookmark the permalink. I bought these shoes a few days ago in an Italian store, about two hours away from Venice. They are the only brand the store (which is a “general sports” store) carries. I wonder about their origin, too! I am not a pointe expert. I’ve studied jazz-contemporary dance for ten years, but (alas!) I was never taught to go on pointe. 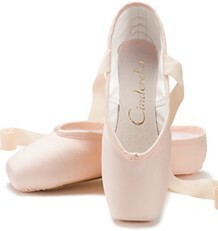 I bought these shoes on a whim, just because I felt like trying the pointe. Who knows… maybe I’ll try taking classical lessons in near future. I might be able to go back to the store and ask the owner where he gets these. Thank you, Danseuse, I appreciate the information. If you were able to buy them a few days ago, then the chances are good for finding their origin. Looking at the photo, I find them to be a very pretty shoe. Asking the owner where he got them would be fantastic! I still haven’t found a Rusbal website. The name RUSBAL could be an abbreviation of Russian-Ballet, who knows? Please, I am desperate to find this shoe again! What was the name of the store?! I was very lucky in that bought a very clean looking pair of Rusbal`s off Ebay in the UK a few months ago. I went on the site early one morning ,and there they were.! I contacted the woman straight away,and asked her if I could Buy It Now for £40 and she agreed. I was delighted as a pair came up for sale a few months earlier and the bidding for them was insane.I think they eventually sold for £85,which was way out of my price range. Collecting vintage and rare brands of pointe shoes is like an obsession for me. Apart from the Rusbal`s, I also have black Ben and Sally`s,La Mendola of New York, Ting, Selva, Klings of Chicago, Blanscet, Teplov, Ushi Nagar,Angelo Luzio, Rumpf,Turning Pointe, Domyos, Triunfo ,Inspire, Etirel, Gandolfi, ReArt, Bellini, Baryshnikov,Aloart, a black pair in a box which says A.Chatilla and Company,and 2 pairs that look very old and identical to each other,that have real fur inserts in the toes. As well as these,of course,I also have Freeds,all the Bloch`s,most Capezio`s Capulet, Cameo, Grishko,So Danca,Chacott,Leo`s,Dansgirl, Shactner,Fuzi,Gamba,Gaynor Minden,Repetto,Merlet,Suffolk,Prima Soft,Bleyer,Stanlowa,Karl Heinz Martin,Bob Martin,Wear Moi, Sansha, etc.Also 4 types of Russian Pointe,and 11 different types of Bloch,although I do plan on buying every type of every brand, but it costs me a fortune.!! I have 48 separate brands of pointe shoes at the moment. But as far as I know,there are still another 49 different brands to buy,so I`ve a long way to go yet .!!! Last count,I had 103 pairs of pointe shoes. Amazing collection! Simply fantastic! I am now VERY intrigued with that box of yours that says A. Chatilla and company. Yes.Sorry,I really must learn how to send you photos.! Just found the box.It is a lovely black satin pair of pointe shoes inside,bought from Ebay US. On the box is a picture of a ballerina.It says Divine Design a.chatilla &co. Underneath it says For All Your Dancing Needs. On the side it says Dance Footwear.Black Kid. There`s no address,city or anything. The digital camera is somewhere in my teenage son`s room,which looks like a bombsite.! If I ever find the darn camera I will send you photos.Lisa. By the way,I can find no name or markings anywhere on the pointe shoes themselves. It could be that this A. Chatilla did NOT make pointe shoes,only other types of dance shoes,or it could be a shop.The person selling the shoes to me may have just put them in a shoe box with the name A.Chatilla on it. I`ve certainly Googled the name a few times,and came up with nothing. Me again.I`ve just Googled once more,and A.Chatilla are based in Staten Island,New York.They have no website or email address,but there`s a phone number. Definately still seem to be in business.They have received some pretty poor feedback comments from customers.With no email there is no way of asking them if they make ,or used to make,pointe shoes. Someone will have to telephone them.Sorry,but I`m not phoning New York from the UK !!!!! 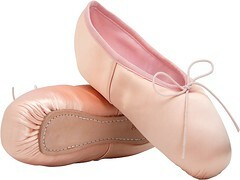 I can’t help you find a pair to purchase, but I can tell you that I did own a pair back when I was still dancing. I purchased them around 1994? They were advertising in Dance Magazine at that time, and I was intrigued, especially since they had a V shaped vamp and a very tapered box. (I have really, really wide, short feet and I always preferred V vamps and tapered boxes to make my feet look less square and stumpy, and there weren’t many V vamps available at that time). Something that I can say about them that you might find interesting is that they used water-soluble glue. Or at least they did circa 1994. It wasn’t a fact that they advertised, and I found it out the hard way. I sometimes dampened the inside of the toe box to help break in shoes, and it hadn’t been a problem with my Blochs or Capezios, so I wasn’t expecting trouble. After I dampened the insides of the Rusbals and started wearing them, it became apparent that that had been a terrible idea. The whole box just started…turning to mush as I was dancing in them. The box sort of crumpled downwards. I took them off as soon as I noticed, in hopes of salvaging them, but they were all smashed out of shape by then. It was very unfortunate, because they were very pretty. I purchased a pair of Rusbals yesterday! They are lovely, I have not sewn ribbons and therefore cannot tell how they will work, but I sure look forward to it! On the other hand, and more pertinent to this blog, I do not want to ruin them, because I can see no way to replace them; the lady at the store had only one more pair, and it was the next largest size to the one I got. She told me that her supplier does not bring them anymore, but I could not clarify whether the supplier discontinued them or the company went out of business. I tried a russian search in the hopes of finding the company’s website or a store website that might carry them, but no luck. On the shoe itself, it is a lovely whitish-pink color, has a small platform and must be the same model as the one in your picture, because there was a “2” stamped at the top of the sole, and I guess this refers to the model. Therefore, like in the picture, the side seams are almost at the middle of the shoe and I noticed that the wings reach almost to that part. There is also a drawstring and the vamp is between a “U” and a “V”. I acquired 2 pairs of Rusbal pointe shoes about 16 years ago. I’ve always wanted more of them because of how they never smell like sweaty feet. My brother-in-law who speaks Russian says that Rusbal translates to “russian ballet”, which is not any help in being able to find them. 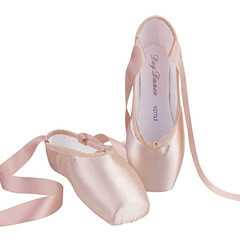 However, I did just find this website: http://www.the-perfect-pointe.com/orusbal.html, which has an ADDRESS and PHONE NUMBER! So I wish you good luck in purchasing them. 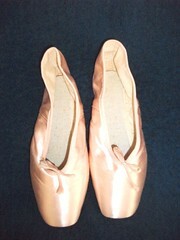 I have a pair of Rusbal pointe shoes dating from around 1977…. Ich habe ein Paar fabriksneue, unbenutzte Rusbal’ zum Verkauf bei Willhaben. Leider haben die Leute kaum eine Ahnung, worum es sich handelt bei Rusbal- es ist doch nichts Neues, dass dieser Schuh sehr schwer zu bekommen ist. Rusbal’ ist von der Marke ” Rumpf”- die Seite ist jedoch nicht mehr aktiv heute, vor einigen Monaten, war sie es noch. Nur ist Rumpf doch deutsch und nicht russisch…alles etwas verwirrend. Liebhaberffenbar immer noch, da mein Inserat oft angesehen wird. Schönen Dank, an die Ballettschuh begeisterte Bloggerin, die hier ihre Sammlung zu Verfügung gestellt hat und ihre Recherchen mit uns geteilt hat! Ich verkaufe meine Rusbal’ gerne an Liebhaber, Bilder seht ihr auf Google! I have a pair of brand new, unused Rusbal ‘for sale at Will. Unfortunately, people hardly have any idea what this is about Rusbal – it’s nothing new that this shoe is very hard to get. Rusbal ‘is from the brand “Hull” – the site is no longer active today, a few months ago, it was still. Only hull is German and not Russian … all a bit confusing. Entholleable still because my ad is often viewed. Thank you, to the ballet shoe enthusiastic blogger, who has made her collection available here and shared her research with us! I like to sell my Rusbal ‘to lovers, pictures on Google! Thank you, Susanne, I hope Google did a decent job translating your comment. 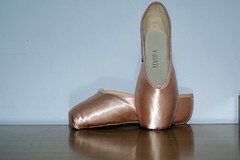 Best wishes on finding your Rusbal pointe shoes a new owner.